For any product startup, prioritisation is everything. Spend time working on the wrong things, and you’ll waste both time and money – two things you have in very limited supply as a startup. Lots has been written about prioritisation in product teams, and it’s often cited as one of the biggest challenges facing startups and product teams today. But it’s really not that difficult if you approach it with deliberate focus. Find the highest-leverage things (features, services, tools) and focus on those first. As a Product Manager you’ll be constantly bombarded with new ideas: the might be your own ideas, they could come from the founders, from customers, from investors, or from your team. There’s never any shortage of ideas – and that’s great. The problem is that investigating and assessing these ideas takes a lot of time. To make sure you only spend time on the things that matter, (and to keep your sanity), you need to be able to quickly and effectively triage this flow of input. I have a simple two-step framework I use to quickly triage ideas. Does this idea, if implemented, directly and positively impact our key product goals/metrics? This step is simple. You just need to ask: if we do this, will it have an impact on what is important? Will this idea, if implemented, have a positive impact on the goals you’re trying to achieve? Does it have leverage? If the answer is ‘no’, you know you can immediately stop investigating. Maybe this idea will be useful later, when your product strategy matures and focuses on other goals, or maybe it will never be useful. Either way, don’t waste any more time on it. Note that in Step 1 we don’t consider how to implement the idea. How is irrelevant at this stage: the only question that matter is: is this the right thing to do? 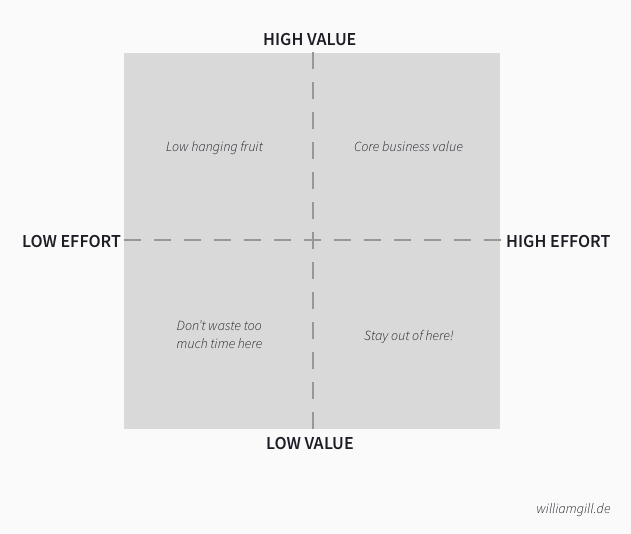 Is the effort/impact tradeoff aligned? If the idea doesn’t fall into the top part of the graph, discard it. You don’t want to focus on low-value items: even when the effort is really low. Avoid the trap of thinking “oh well, it’s only a couple of hours’ work, so…”. Every hour you spend on low-value work is an hour you’re not spending on high-value work. Don’t do it. If you’re honest with yourself about the value each idea contributes, and to which goal, you’ll find you can safely discard many, if not most, of the new ideas that come flowing your way. When you learn to filter and triage quickly and effectively, you’ll minimise the time you spend on dealing with noise and be able to spend more time focussing on what’s important. Try it out and feel free to let me know how it works for you. This entry was posted in Product Management and tagged prioritisation, triage. Bookmark the permalink.